As we all know, the year of the Water Dragon is finally here! It is only natural for people to adorn themselves with something that has to do with this ferociously fanged mythical creature. According to Chinese geomancers, more commonly known as Feng Shui masters, possessing a feng shui dragon is considered auspicious and powerful this year. While I personally don’t subscribe to superstitious thinking, I thought why not? It won’t hurt trying anyway. Hence, I am giving myself and you dear readers a symbolic dragon gift: a review on this tablet run by a “lucky” Snapdragon processor. It is not just a tablet by the way, it is The World’s first 7-inch Android 3.2 Honeycomb tablet, also known as HUAWEI MEDIAPAD. For those who are unfamiliar with the brand, HuaWei, officially Huawei Technologies Co. Ltd is a Chinese multinational networking and telecommunications equipment manufacturer. Founded by Ren Zhengfei in 1987, it is the largest networking and telecommunications equipment supplier in China and the second-largest mobile telecommunications infrastructure equipment supplier in the world. It currently caters to 45 of the world’s 50 largest telecom operators. Huawei Technologies Co. Ltd is headquartedred in Shenzhen, Guangdong, China but has 20 R&D institutes around the world. The company is said to have over 110,00 employees with almost half dedicated to R&D work. 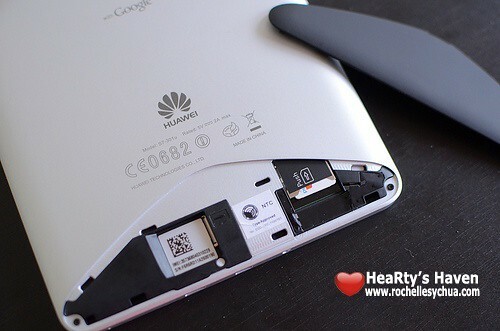 Check out this photo from Rochelle’s Huawei Mediapad review to view the MicroSD and SIM slots. You can also check out another great review about the Mediapad and know more about how it handles in real life by Calvin Lo. I first heard of the Huawei MediaPad when Engadget raved about this dashingly handsome device, calling it “downright luscious”. I was naturally curious to learn more about this China made product, after all it is not every day that you hear a respected tech savvy geek throwing girlish praises. After a quick search on the internet, I discovered that this gizmo has more accolades hiding under its skin. According to reports and reviews, The Huawei MediaPad is not only the first tablet to date running Android 3.2 software, it is also graphically superior with its pixel density of 217 ppi, surpasing Motorola Xoom’s (erstwhile highest tablet pixel holder) 160 ppi and Ipad’s 132 ppi. Its screen resolution is 1280×800 (HD 720p capable). While the specs may not be highly sophisticated and complex, it is still state-of-the-art quality and decent enough to boast around. Powered by a 1.2 GHz dual-core Qualcomm Snapdragon processor, the tablet is built for some serious browsing experience with is 7”IPS LCD capacitive touchscreen display and WiFi 802.11 b/g/n, 3G, HSPA+ 14.4 Mbps internet connectivity. And for those shutterbugs who just love to share their moments with others, the MediaPad has two built-in cameras, a 1.3 megapixel front facing camera and a 5 megapixel autofocus rear-facing camera that has HD video recording capabilities (720p). The quality of pictures taken using the front and rear cameras are not the impressive, but it’s good enough if you don’t have a digital camera or a DSLR with you. The default resolution is 2592×1944 for the rear camera and 1280×720 for the front camera, which is really awesome because it’s BIG! Now, if you are skeptical and comparing each detail with the pedestally-placed iPad or the equallyrevered Samsung Galaxy, then consider this fact: it is the cheapest android tablet on the market (by banchek) . As Huawei’s Chief Marketing Officer Victor Xu succintly puts it “With the Huawei MediaPad, we are demonstrating yet again that design, functinality, and performance is within anyone’s reach.” The Huawei MediaPad is respectable with its features relative to its price. “The MediaPad opens up new worlds of entertainment for consumers by removing the barriers to tablet ownership, increasing access to a truly high-quality mobile entertainment experience fully integrated with cloud-based internet content,” said Xu in its press release. While the iPad’s feature is touted to be up there, so is its price. This is definitely a hurdle to the wider market. HuaWei is definitely taking the noble road by cutting down the price of its tablet without compromising the overall performance of the gadget. Weighing just 0.86 pounds, the Huawei MediaPad can store chunkie data with its 8GB internal storage and can be expanded up to 32GB via micro SD card. And if looks can be anymore deceiving, this slim and light tablet is also strong in terms of endurance. Its thickness is not that thin and not that thick, just perfect! With its 4100mAh battery, the fun can last up to 6 to 7 hours. And as if HuaWei can’t be anymore generous, the MediaPad comes with pre-installed Apps like Facebook, Twitter, Let’s Golf, Document to go, and many more. Huawei Mediapad does not support embedded capture and I have no plans in rooting it. Anyway, I can still take screen shots of my Android UI using Huawei Hi Suite desktop software that comes with the device. You can easily install the software by plugging in the Mediapad to your Windows desktop (I have tried this in my Mac, but I think there’s also a Huawei Hi Suite for Mac). After plugging it via USB, Hi Suite installation will prompt and you can install it in a breeze. After installing Hi Suite and connecting your device, Huawei Office will also be installed automatically in your device. Another thing that is quite disappointing with the Huawei Mediapad is that it has an HDMI slot, but it doesn’t come with a free HDMI cable. Hehe. But that doesn’t really matter for a lot of people I guess. This review has made me realize that HuaWei’s Snapdragon MediaPad is indeed auspicious and powerful to those who own it because you get three of the most important factors of a tablet: design, functionality, and performance in a very reasonable price (SRP is 21,990 pesos). For the latest updates on Huawei Mediapad and other Huawei products, you can follow Huawei PH on Facebook and Twitter. DISCLAIMER: The Huawei Mediapad was given for free by Huawei to me last December 2011 and this post is sponsored by… Huawei! Thanks Huawei! Weeeeeeee! This entry was posted Jehzeel in Reviews and tagged Android, Android Tablet, Cheap Android Tablet, Huawei, iPad, Tablet. Bookmark the permalink. ← It’s a great time once again! uy, first ako, eheheh! first time! wow, ayos ah…pag pinagsawaan mo na, toss mo dito sa akin ahahhaha! Mukhang okay ito ah para sa presyo. Jehzlau Concepts nga ba tong napuntahan ko? Parang tech blog ah hahaha..nice review..arbor! Wow congrats Jehz ang ganda talaga ng pasok ng taon sayo….sana may pamimigay pa.lol..
ikaw n.. ikaw n tlga Kuya.. 😛 hahhahah.. after BB – Huawei tablet nman.. super Inggit c LULU — > hehhehheehhh.. 😛 Your the man!!! sure sure! added! under cool new friends! is it really good compared to ipad? ang ipad 1 ngayon mura nalang diba? ang diff lang naman sa 2 is walang camera?? Ganda nito, dapat eto ung kasama sa PLDT telpad. Jehz, nagaappear lang ung comment ko kapag reply, haha. Gusto ko to Huawei na to, high-end tablet. Valentine month na pala, haha. Awwww… hanapan kita magandang news theme. Sir my tanong ako!! !pwde bang madisable ung ads sa google if same na i.p na ginagamet thanks! !pwede bang makuha ulit ung account na disable pano poh? ?thanks ulit kuya jez!!! aww.. hindi eh.. hehehe.. Yung account na na disable, may slight chance na makuha ulit, basta maganda lng explanation mo. gud morning ulit sir jez! !panong magandang explanation! !parang iniignor nila ung explanation eh! !pano poh ba pwede poh pa2long!nagulat kac ako bglang na disable eh! !thanks poh sir jez!! Sir gandang gabi!! !pano ba magkaroon ng sariling domain?? ?magkano ung mura at ano ung dabest? ?kac bago lang ako e! !thanks sir jez!! ngek inaply ko na sa google dati eh! !pwede paba un??! !mgakano naman po sa go daddy? ?wala pa akong pambili eheheh!! @henry iblog 8 this coming april ata? 😀 nung iblog7 kasi april din eh..
sir jez my tanong lang akO! !pwede bang lagyan ulit ng ads galing sa google if nadisable na pero my ads ako sa ibang blog ilalagay ko sa isa kong blog pwede ba un??? Sir jez gandang gabi d2 ulit ako!! := my tanong ulit ako pano malalaman kung ban na ung site??? Tanong ko lang po.. Naapektuhan po ba kayo nung g0ogle page layout update? Kung oo, may ginawa po ba kayo para solusyonan iyon? Tsaka kung maaari po, pwede po ba kayo magbigay ng konting overview tungkol sa advantages kapag ang website nyo ay nasa google news tulad po nung Batangas Today ni kuya Marhgil? At kung ano rin po ang advantages kung ikaw ay writer sa isang news site na nasa go0gle news. Sige na po please. Para lang po sa ikalilinaw ng mga agam-agam naming mga baguhan sa blogging at internet marketing. Maraming salamat po. At tsaka okey lang po ba sa inyo na magtanong ako ng magtanong dito kasi madami pa po ako tanong eh?.. hehe. ah.. ganun po pala, it’s all about topping the serps.. kala ko mas mataas ang cpm or cpc ng adsnse pag nasa Gnews kaya andami kong nababalitaan na mga nagsisikap ma approve dun (sa Gnews). sa pananaw po ninyo, maituturing po ba na obtrusive placement pag within the blog post yung ads? (i.e. below post title and/or in between paragraphs). salamat sa pagdaan araw araw! HAPPY Valentine’s DAY po sa inyo!!! Saan po ang date nyo mamaya? 😛 deretso uwi ah sa mga binata’t dalaga ah! Sa mga Advertiser dyan! mag-ads na kayo here sa site ni Jehz.. hindi kayo mag-sisisi.. HAPPY HEARTS DAY TO ALL!! happy february 15! :akopa: 15 na eh,. hahaha! saan ka di nababayran halo? PS: nag corrupt yung image files, pero hindi lahat. Hehe. pwede na mag login saan? Ay, Dati pa to sa Blog log-in, haha. oo nga eh, buti saglit lng sila nag bakasyon.. teeeheee..
Gandang gabi sir d2 ulit ako ehehe!!! sana nga every month eh may contest dito sir jehz. Another review ng new gadget tapos pagamit, haha, joke! Hi! Just get curious on your blog. After several months of using the media pad… how was it now (performance-wise)? 🙂 mg kano po ba yong ipad2.nyo. I’m trying to buy a tablet and one of my choice is just 2 iPad2 and Samsung Tab2 10.1 and now saw this review come to think of seeing physically the Huawei Mediapad.